Would you like to be a well-known business visionary in pressing industry? At that point, you ought to know how to inspire your merchants and clients. In pressing industry, pressing of materials by Sleeve Applicator by Siddhi Vinayak Engineering assume a key part and it is an instrument to awe your merchants and clients. The marks which have been glued over the materials make an impression about your item and organization. Barrel is an item which looks fit as a fiddle and these articles might be in any size and shape. Numerous organizations fabricate barrel shaped questions and marking physically in these items is an intense errand. 28mm -125mm dia., 320mm Height Max. Siddhivinayak Engineering, established in the year 2012, is known to be one of the leading manufacturers, exporters, wholesalers and retailers of this impeccable range of Labeling & Capping Machines. Making of this range is done as per the set industry norms and guidelines, its standard of quality, performance and service life, is highly commendable in nature. 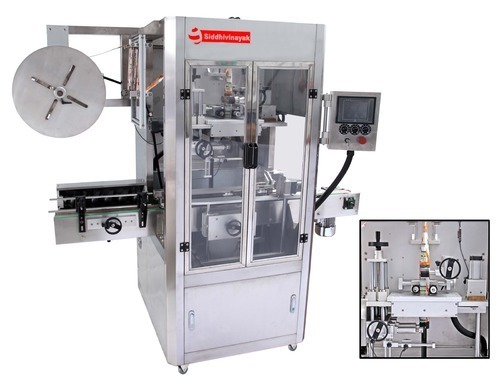 This range is made up of the finest and highly commendable products like Liquid Filling Machine, Sticker Labeling Machine, Shrink Sleeve Applicator, Capping Machine, Industrial Conveyor, Bottle Labeling Machine and much more. which are widely acclaimed and asked for in the market. In addition, it is marked at the most reasonable rate possible. Our state-of-the-art infrastructural facility, laced with all the necessary machinery and equipment, is known to facilitate the attainment of several of the firm’s goals and objectives. For reasons of attaining greater market share, we keep upgrading the facility on a highly regular basis. In order to manage the operations of the organization in the best possible manner, the facility has been divided into a number of highly operational units, led by skilled and experienced professionals. These units with utmost dedication facilitate the attainment of greater productivity. In addition, our ethical working habits, have helped us generate a huge and highly reputed client base.